The Life is Beautiful Music & Art Festival is the fourth annual festival that brings all people together to create an immersive music, art, food and idea experience. Musicians, chefs, artists and speakers come together and give attendees this amazing experience. This year it will be taking place in the Western Hotel and Casino in downtown Las Vegas, Nevada. 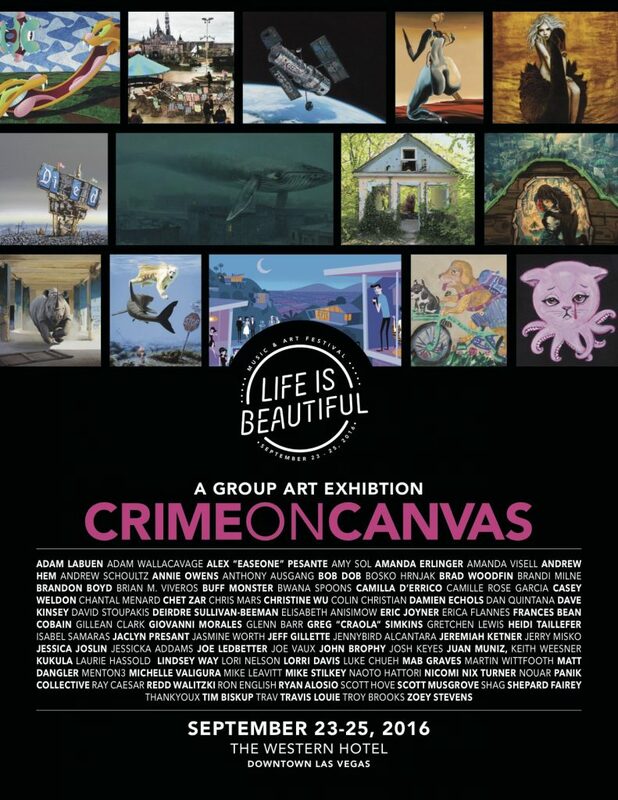 Life is Beautiful has partnered with the M Modern Gallery to bring an exhibition called “Crime on Canvas” to the three-day festival. Attendees have the exclusive opportunity to view and purchase original works and rare prints by more than 80 artists from the local, national and international level. The theme of the exhibit is planned to be dark and eerie, showcasing pieces fully-encompassing that idea. General Admission and VIP 3-day tickets are available here. Shag, illustrator best known for creating album covers for Smash Mouth, Nancy Sinatra, Pixies and more. Brandon Boyd, lead vocalist for Multi-Platinum rock band Incubus. Shepard Fairey, known for his iconic Obama campaign poster. Frances Bean Cobain, daughter of Kurt Cobain and Courtney Love. Colin Christian, known for his latex costume worn by Miley Cyrus. Elisabeth Anisimow, nine-year-old artist featured on an upcoming episode of Nickelodeon’s “All In With Cam Newton” and many more. Amy Sol, Casey Weldon, Gillean Clark, Juan Muniz, Giovanni Morales and Jerry Misko, who are all Las Vegas natives.